It’s hard to get excited about a practice green, but it’s compulsory for a club to have one. We at New Monuments would settle for a drawing. To that end, your solicitous and vigilant Board, aware that the membership won’t settle for a photo of any old green, has its heart set on one designed in 1920 by the Olmsted Bros. of Brookline MA, sons of one of the fathers of New York City’s Central Park. 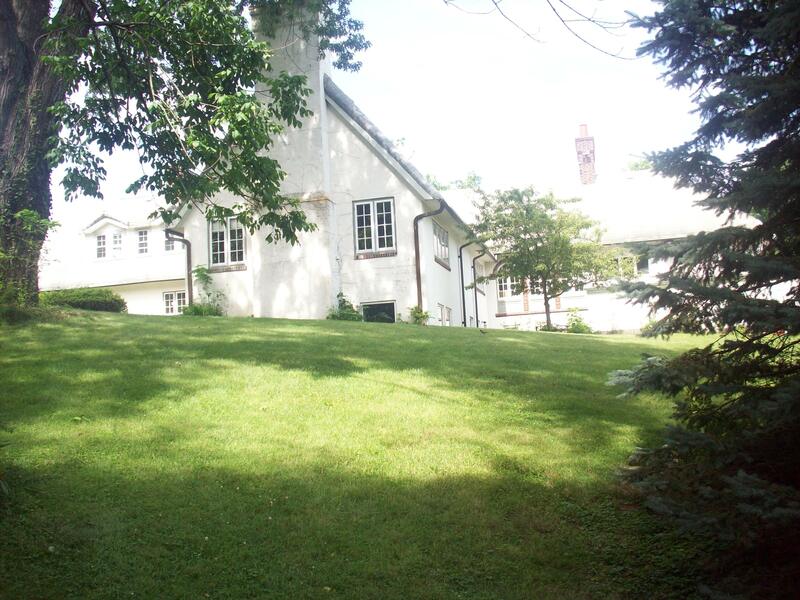 The Bros. fashioned it for Sunnyhill, a property in a suburb outside Pittsburgh PA called Mt. Lebanon (the Old Man’s native soil). 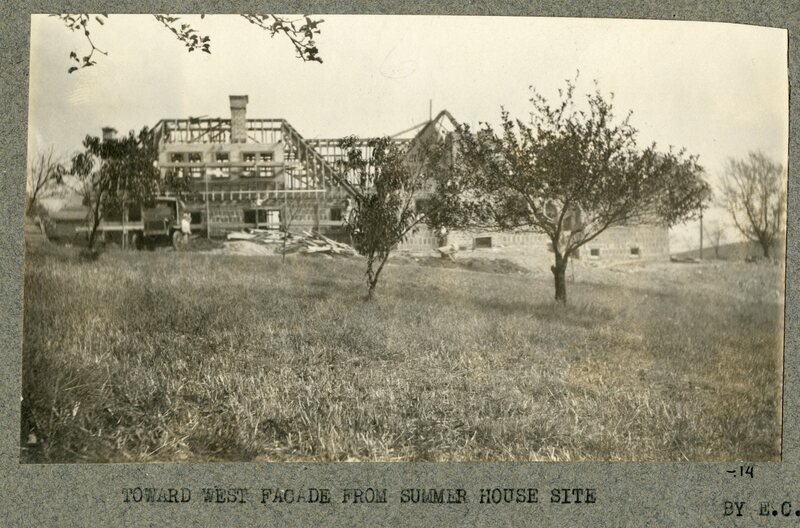 Sunnyhill was built for a man named Joseph Roush, who wanted, and got, from his nephew Stanley, the official architect of Allegheny County, a home in the English Cottage style, complete with faux thatched roof. 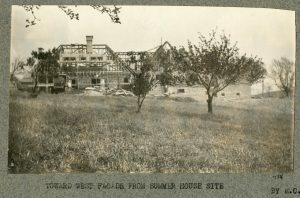 Joseph fell on hard times during the Great Depression, which may have prevented the Olmsted Bros. from carrying out their plans to the letter, including the detail of a private putting green. This is not what our members want to hear, but it should not daunt us. We aren’t without recourse. Consider Plan A: Children in the neighborhood around Sunnyhill, owned since 1971 by the Unitarian Universalist Church, could snoop around for the putting green, or traces of it, on their way to school. Consider Plan B: Investigating on our own. Your Board is inclined to favor Plan A. Kids can be bought with ice cream, and what boy or girl can resist a shortcut – even if it leads to the classroom! The risk of the plan is that they are usually spellbound by something other than the task before them – such as by television’s Chiller Theatre, an “Experiment in Terror” from 1963 to 1983 in the former Steel/Smoky City. Chilly Billy, Captain Bad, Terminal Stare and Stefan the Prankster were as real as any math problem or scientific revolution. Today’s distractions are more numerous but similar, with the result that the mailman can still be mistaken for Frankenstein, an axe murderer or a sci-fi villain. To children in this state of mind, the sylvan setting of Sunnyhill is another planet, a pirate ship, a castle, a forest – where perchance, to return to our concern, a putting green may be. Who votes for Plan A? In the 1920s, the house was enclosed by a hedge. 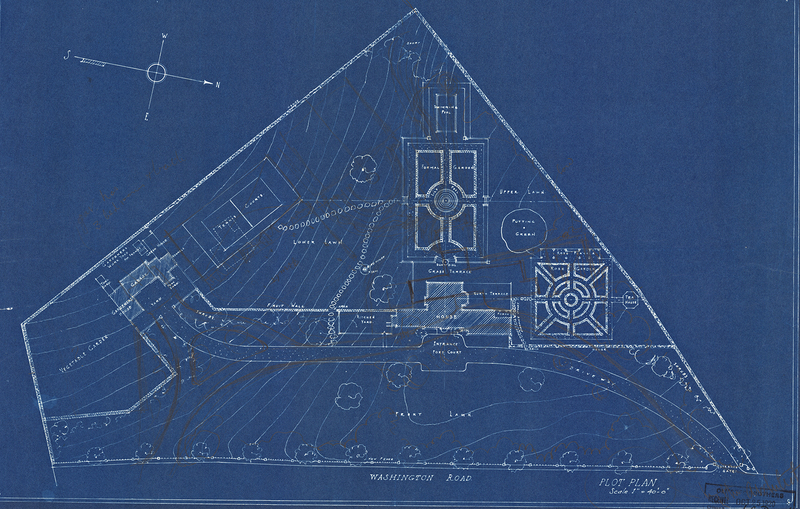 A rearguard action, the safest line of approach, would have led the curiosity seeker past the swimming pool and formal garden with its lily pond to the putting green on the upper lawn, with the rose garden’s pergola behind it as a reference point from a distance, especially if one were nervous or distracted and crawling on one’s belly. More daring would have been a maneuver from behind the tennis court. You would have had to slink between the fruit wall, bird house and sun dial right by the house. Our charges will of course be equipped with up-to-date recon. Heart and theme of the school! First labor relations, now love! Reminiscing graduates (our Old Man being one) will swear they lost that homework assignment. Precocious remarks about I.W. Abel or the Summer of Love would have been grounds for being sent to the principal’s office. There is a good chance that the Unitarian Universalist church, which has been active in the civil-rights, feminist, LGBTQ and social-justice movements, will forgive us our trespass. In fact, its own arrival in 1971, which included non-white congregants, would have been condemned as trespass by some in the community. It takes a leap of faith not possessed by the Board to believe in interfaith teas around the Sunnyhill putting green and acceptance at exclusionary country clubs. Evidence to the contrary will be afforded an airing here. For members who feel cheated by a drawing, the Board will consider putting feelers out to brick-and-mortar clubs about sharing a real green, as long as pesticides and herbicides aren’t involved.